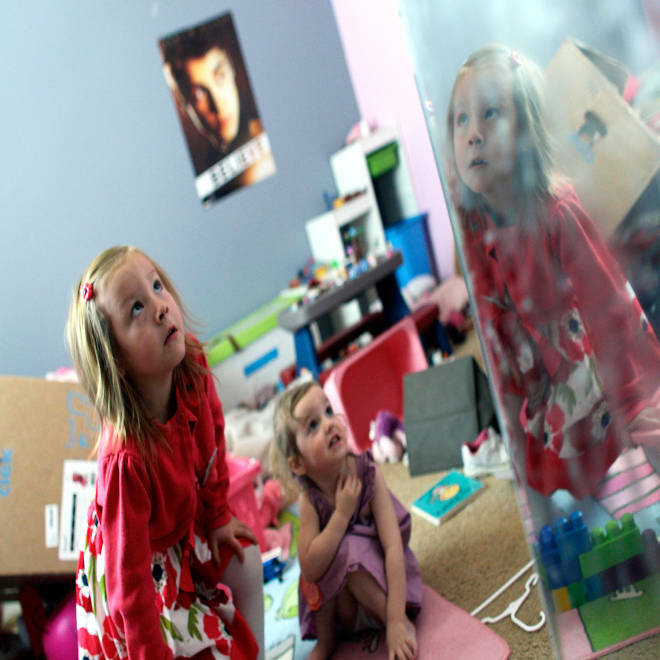 With her face reflected in a mirror, Coy Mathis, left, a transgender girl, plays with her sister, Auri, 2, center, at their home in Fountain, Colo., on Monday, Feb. 25, 2013. Coy's parents are suing the Fountain-Fort Carson School District 8 after she was denied access to a girl's bathroom at her elementary school. A transgender 6-year-old who identifies as a female should be allowed to use the girls' bathroom at her elementary school even though she was born a male, the Colorado Civil Rights Division ruled on Sunday. In a decision being hailed as a major victory by advocates for transgender Americans, the division concluded that the Fountain-Fort Carson School District created an unnecessarily hostile situation for Coy Mathis when it made the female bathroom off limits. By not allowing Coy to use the girls' restroom, the school "creates an environment rife with harassment," Steven Chavez, the division director, wrote in the decision. The school district, about 15 miles south of Colorado Springs, Colo., also showed "a lack of understanding of the complexity of transgender issues" by referring to Coy as a male or using quotes around "her" throughout the litigation, Chavez wrote. The school district could not be reached for comment on the ruling Sunday. Coy was born a male, but began at an early age to identify as a girl through toys and dress and started calling herself a girl between the ages of 4 and 6, according to the summary of the division's ruling. In August of 2011 she was enrolled in kindergarten as a boy, and when other parents and teachers did not recognize Coy as a girl, she began suffering from depression and anxiety that affected her ability to learn, Chavez wrote. Coy's parents asked the school district to treat their child as a girl, and officials initially agreed, the ruling said. But when Coy got to first grade, the district told the family she would no longer be able to use the female bathroom and instead had to use a staff restroom or a gender-neutral facility in the school's medical office. Coy's parents pulled her from the school and filed a civil rights complaint in February. The Transgender Legal Defense & Education Fund, which worked with the family, said in a statement Sunday that the ruling is the most comprehensive ever in support of transgender people's access to bathrooms without harassment. “All we ever wanted was for Coy’s school to treat her the same as other little girls. We are extremely happy that she now will be treated equally,” Kathryn Mathis, Coy’s mother, said in statement on the group's website.